Picture your feet dangling above the clearest blue water you have ever seen, watching the most incredible sea creatures gliding peacefully through the water, while waiting for a picture perfect Cayman Island sunset—sounds like a fool proof escape from all the rush and commotion of the city this summer. The Kimpton Seafire Resort and Spa is the perfect family island retreat surrounded by unimaginable beauty and tranquillity. Situated on the world famous seven-mile beach on Grand Cayman, Seafire is easily accessible via direct flights from 20 destinations including Boston, Chicago, Houston, Miami, New York and London. The resort is the Grand Cayman’s first design-driven resort, evoking the essence of the islands past, present and future, incorporating both British colonial touches and the latest state of the art technology elements. Known for its bright botanical color palette, Seafire draws in its inspiration from the landscape itself, by incorporating sandy weathered woods and stone which is enhanced by lively native plants and trees that summate its surroundings of sun, sand and sea. A signature design feature at this intriguing resort is Seafire’s Caymanian catboat, Miss Ola, which has been painstakingly restored in a nod to Grand Cayman’s mariner culture and history and suspended from the library’s ceiling. Moreover, the boundless open-air architecture offers commanding views of the sea at every turn, unfolding to meandering gardens. The interior spaces harmonize rustic yet polished elements, as if the harsh rays of the sun and the salt of the sea withered them. The sea is never out of site as the lobby is elevated 24-feet above sea level which allows views of both the coastline and horizon, as well as protects the natural vegetation and sea turtle nesting areas—so you can enjoy your stay knowing full well the turtles are safe. The Seafire resort encompasses 266 luxuriously decorated guest rooms and suites, that are outfitted with up-to-the-minute technology. Guest rooms include distinctive features such as spa bathrooms, wide orientations to maximize ocean views and convenient kitchenettes. 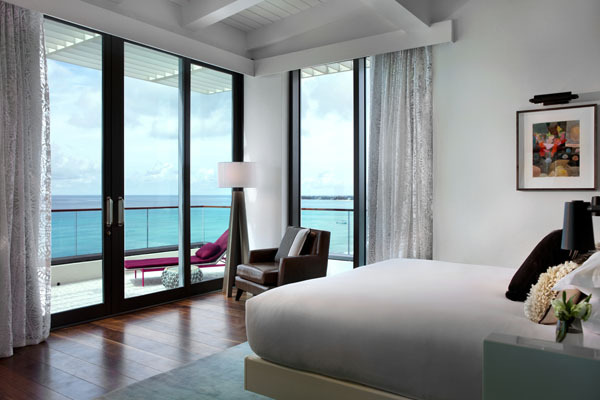 All 10 deluxe floors are designed to frame panoramas of Seven Mile beach with its floor-to-ceiling windows and private balconies, to ensure that you soak up the Grand Cayman atmosphere. The diverse menu of rooms you can choose from include a 10th floor penthouse presidential suite, with two bedrooms, direct oceanfront views, an indoor and outdoor kitchen, a private wraparound balcony, and separate indoor and outdoor living area, 118 ocean front junior suites, 10 studios and 3 private bungalows, each with their own unique sense of style and unmatched luxury. Escape effortlessly into a sensory adventure as you and your family embark on an adventure involving kayaking on the Caribbean Sea, navigating a Hobie Cat sail boat, or gliding across the water on a paddle boat and discovering the majestic creatures of the sea up close and personal at stingray city or Cayman turtle farm. Although multigenerational family fun flourishes at Seafire, they understand sometimes kids need to hang out with people their own age. Camp Seafire is a program offered to ensure your kids are entertained with programs guaranteed to spark creativity and adventure. While the kids are off learning and exploring, parents can enjoy a calming round of golf on the 18-hole championship golf course, with picturesque views at every hole. If you were looking to unwind, the 8,500 square foot spa offers a range of soothing services, including massage therapy, facials, steam room and much more. 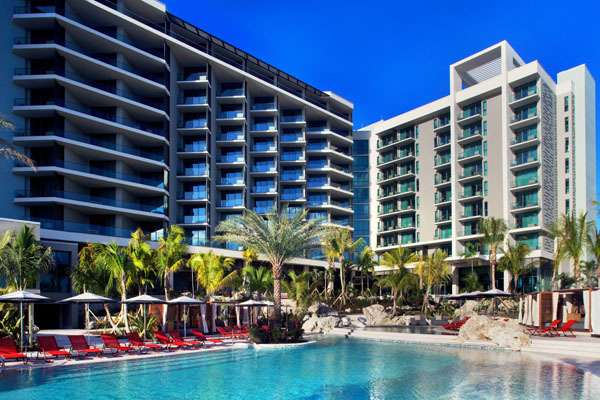 Consider Kimpton Seafire Resort to be your next unforgettable family vacation.